The following members have been selected to the Ground Support Equipment YYZ Shift Committee. These members will represent your department for all shift discussions and negotiations in 2016. The 2323 Family BBQ was a great success! I want to thank everyone for making this year’s BBQ a huge success. A lot of hard work went into this and feels great to see our membership come out and come together and get involved. We had a huge turnout and will continue to grow. Seeing the family’s and children . . . → Read More: The 2323 Family BBQ was a great success! 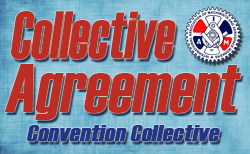 The Conciliator has ordered us to proceed with final and binding arbitration (as per section 79 of the Canada Labour Code) to resolve our differences. Arbitration will take place on Monday, August 15, 2016. Your Negotiation Team will be participating in this Arbitration. On August 2, 2016 a Strike Vote was held and Members voted 79% in favour of a strike. According to the Labour Board the earliest we can go on strike is 12:01 am on August 31, 2016.